Microtubules are hollow cylinders  that are approximately 25nm in diameter  and vary in length from 200 nm to 25 μm. They are formed by the lateral association of between 12 and 17 protofilaments into a regular helical lattice ,. Each protofilament consists of repeating units of polymerized alpha (α) and beta (β) tubulin monomers, all pointed in the same direction. Multiple contacts within the microtubule, between both tubulin subunits and the protofilaments, impart rigidity . 1. The building blocks of microtubules are alpha (α) and beta (β) tubulin monomers, which assemble as heterodimers. 2. These tubulin heterodimers then form linear protofilaments. 3. 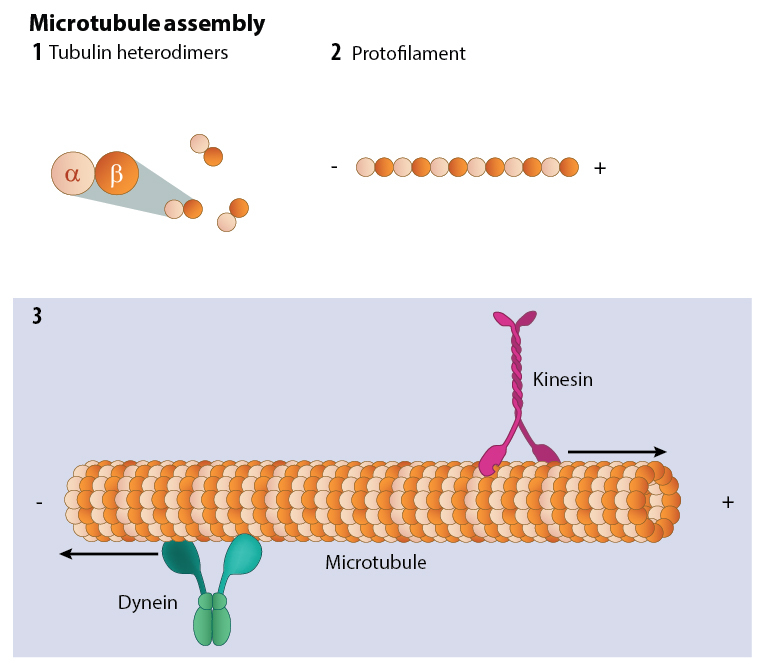 Protofilaments assemble into a hollow cylinders to form microtubules. The motor proteins kinesin and dynein transport vesicles, organelles, and substances along microtubules. Microtubules are among the stiffest structural elements found in animal cells. Despite this they are often bent by the strong internal forces of the cytoskeleton  and display a resilience to shear and twist forces . This resilience is attributed to protofilament architecture, with internal mechanics providing slack against potentially harmful forces. For example protofilaments have been shown to slide over each other when thermal forces are applied to the microtubule , and can twist along the microtubule axis to provide slack for stretched inter-protofilament bonds . 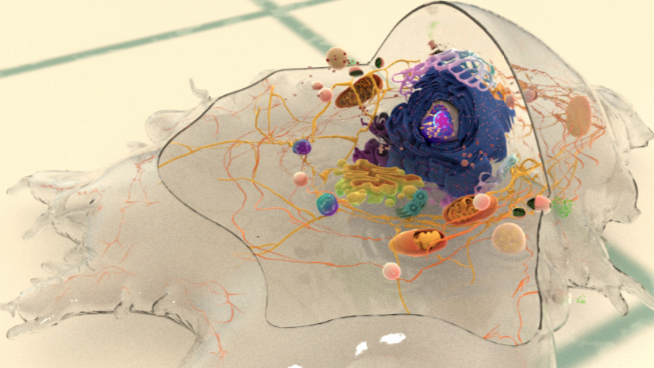 1.To form an architectural framework that establishes the overall polarity of the cell by influencing the organization of the nucleus, organelles and other cytoskeleton components. 2. To form the spindle apparatus and ensure the proper segregation of duplicated chromosomes into daughter cells during cell division (i.e. cytokinesis). The spindle apparatus also regulates the assembly and location of the actin-rich contractile ring that pinches and separates the two daughter cells. 3.To form an internal transport network for the trafficking of vesicles containing essential materials to the rest of the cell. This trafficking is mediated by microtubule associated proteins (MAPs) with motor protein activity such as kinesin and dynein. 4. To form a rigid internal core that is used by microtubule-associated motor proteins to generate force and movement in motile structures such as cilia and flagella. A core of microtubules in the neural growth cone and axon also imparts stability and drives neural navigation and guidance.